Glassblowing: First Steps Workshop; Saturday, April 13th, 12-4:00pm. 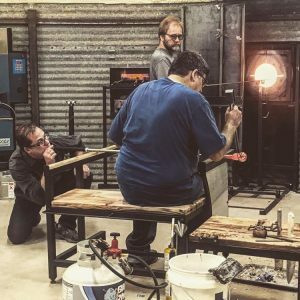 Join Glass Artist Mark Rendulic for this unique opportunity for a one day glassblowing workshop! You will learn the basic steps in the glassblowing process, and after completing this workshop you will have a much better understanding of how each step of the glassblowing process works. 5) How to gather a punty on a punty for a punty. 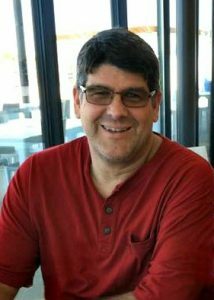 Mark’s Story: Mark Rendulic has over 20 years experience in creating art in glass. In a special made torch, he heats glass at temperatures over 2300 degrees to melt and form the shapes. He finds glass to be more challenging than traditional sculptural art forms. Unlike cold worked forms, glass becomes a free flowing liquid, cools quickly, and has a tendency to boil. The most difficult task requires that he shape it using handmade tools and gravity since he cannot touch it or push it into shape with his hands, due to the extreme temperatures required to move it. His many years of training and experimenting give him the ability to create just about anything he can conceive. Every commission that Mark receives is just as exciting as the first day he spent watching a sculptor create.